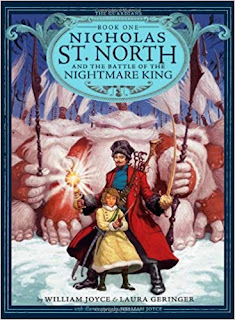 I heard about Nicholas St. North and the Battle of the Nightmare King on #Bookstagram. (It's Instagram, but its all about books!) The cover art was beautiful (in my opinion) and the story line intriguing. This is the first book in a series which re-imagines imaginary characters in roles of guardians of children everywhere (and, I suppose, all the rest of humanity along with them). This first title in the series introduces us to Nicoholas St. North, former outlaw but destined to be known as Santa Claus. Nicholas has come to save the day. He is the first of the Guardians, the rest of which I gather are the Tooth Fairy, the Easter Bunny, etc. Together these characters face and will, I presume, slay the mortal enemy of children, a nightmarish creature called Pitch. As an idea for a book, I found Nicholas St. North intriguing. As a read, I found it ridiculous. Oh, it has promise! It has great potential! It could be completely awesome and I would have enjoyed it if Geringer and Joyce were writing it as a story involving a detailed plot with twists, turns and climax! Alas, I fear they were writing a screen play. (And I bet they were. See here.) Reading this book felt like I was watching what someone wanted to be a movie. This is a pet peeve of mine in a book. A big pet peeve. I can't stand it when an author is clearly writing with the idea of having the book turned into a film. You can always tell when that happens because descriptions are brief but forceful, (I don't know how else to describe it), leave very little to the imagination, and write as if in jest. There's nothing serious about such a story to grasp hold of because anything you might want to guess a little about, or have slowly explained, is just there for you to take in in approximately the same amount of time you'd spend at the theater. I hate these kinds of books for their impudence. I would like it if someone came along and wanted to give this story another go, anticipating only that readers might love it. No expectation for grandeur in the form of plastic action figures! I would appreciate being told a story strictly for story sake. I wanted to like this book but I really just did not. Nor do I find myself in a position to recommend it. There's a movie version if you want to see it and it might be better than the books because a.) ultimately it will take up less of your time and b.) that's that the writers were going for in the first place. Cut to the chase. Skip the book.